Jack Cella, who managed the Seminary Co-Op for 43 years, addresses a group gathered to consider its past and future. 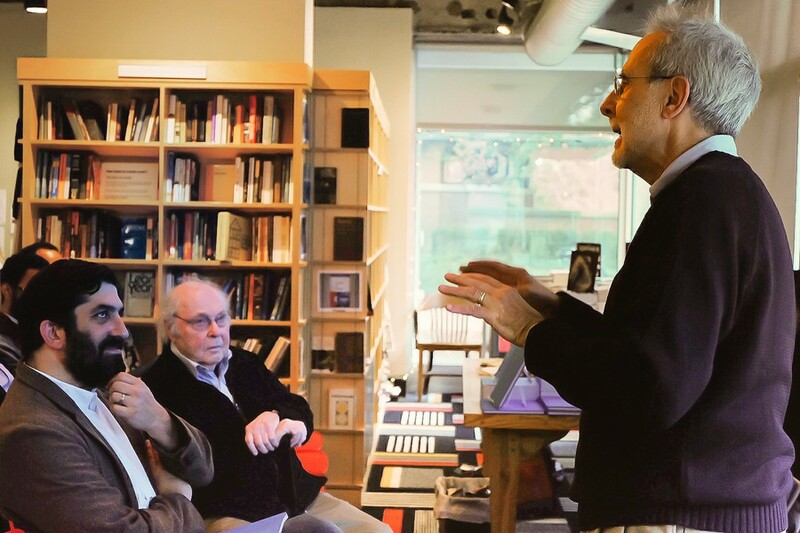 On Sunday, the Seminary Co-Op hosted a launch party for the new book If You Weren't Looking For It: The Seminary Co-op Bookstore, which reflects on the role of the bookstore as a Hyde Park institution. The book, written and compiled by Jasmine Kwong and Megan E. Doherty, is an amalgamation of essays on the Co-Op and related topics, interspersed with pictures of both the old and new locations, as well as excerpts from interviews with professors, students, and other patrons of the store. The Seminary Co-Op was founded in 1961, in the basement of the Chicago Theological Seminary. As the number of small independent bookstores has shrunk in recent years, the Co-Op has continued to faithfully serve the Hyde Park community. After a short reception, former general manager of the Co-Op Jack Cella delivered an introduction. During his tenure as general manager from 1970 until his retirement in 2013, Cella oversaw the expansion of the Co-Op to 50,000 members and its relocation to an aboveground location next to the Robie House. He told stories about some of his favorite Co-Op members while he was general manager. One, a math teacher at the lab school who “would call early in the mornings, three, four, five times a week, and talk about a book he would like to read” with the (possible) insinuation that the Co-Op might like to purchase it. Cella also discussed an encounter he had with the late Dr. Subrahmanyan Chandrasekhar. Chandrasekhar “was thinking about Monet’s series paintings” and needed a book of them, but was unsatisfied with the copy Cella offered him. Eventually, a student working at the Co-Op realized that they would have to buy multiple copies of the book and jerry-rig them together to get the layout Chandrasekhar wanted. The new book sits today in his old home office next to his copy of one of Newton’s Principia. Following Cella, Kwong and Doherty discussed the making of the book. The project originated as a photo documentation concept. Doherty explained that following the announcement of the Co-Op’s move, she “started thinking, well gosh, this space is magical and magnificent and completely unique and nothing else exists like it, maybe someone should be taking some pictures of it.” Kwong was also interested in taking some pictures in the Co-Op. They joined forces in 2012 and have been working together since. The project “evolved slowly and organically over the course of time.” They began doing audio interviews and started compiling a history of the Co-Op. They set up a website and had a small exhibition at Regenstein Library with artifacts from the Co-Op history, and eventually decided to create a book. If You Weren't Looking For It: The Seminary Co-op Bookstore is available online and in store for $30. The original version of this article included several errors. The name of the book, its price, the full scope covered by the essay in the book, the names of its authors and the year they began their collaboration were all misreported. The Maroon regrets the error.